Did you know bed partner disturbance is the UK’s second most common cause of disturbed sleep. Thankfully, ear plugs can help reduce noise at night! Our brains still register sounds even when we are sleeping. Especially in the lighter phase of sleep which is a good thing when you have a crying baby and need to wake up; not good though if you have a snoring husband or wife. The good news is there are various solutions & remedies to help improve how well we sleep at night. A simple health improvement tip is to try using a pair of ear plugs during sleep. I’m going to share with you three recommended ear plug brands, I came across, if you are in the market looking for a earplugs for sleeping. The Mack’s Ultra Earplugs are a good choice to help you sleep in silence. These earplugs come in a variety of amounts to buy, are reusable, and not expensive so you definitely get a lot for your money. Foam is easy to insert into your outer ear canal and expands to fill it in. These are what you expect a typical ear plug to be like and help in noise reduction. If you are looking to block out sounds at night from a partner’s snoring or heavy breathing, passing cars, motorbikes or lorries then these are a good option to go with. Based on reviews from others, these earplugs might fall out of the ear at night. I find foam can also become uncomfortable after wearing for long periods of time, especially if you normally suffer itchy ears. So they may not be the most suitable product for nighttime use for some people. 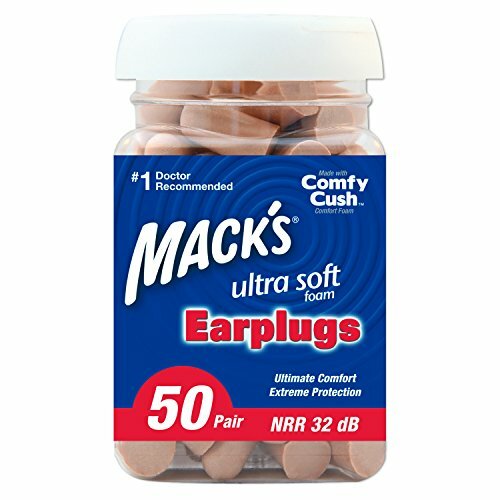 The Mack’s Ultra Earplugs are available to buy on Amazon here . 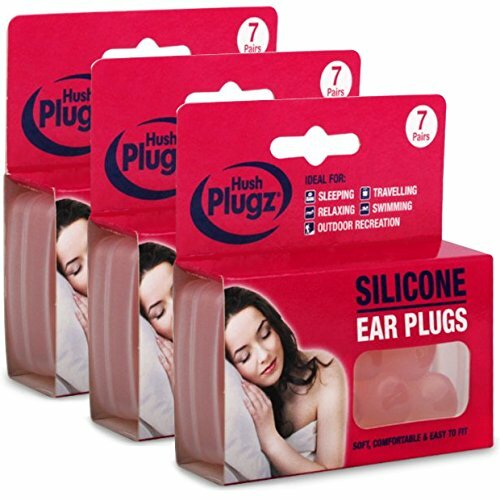 The Hush Plugz Silicone Earplugs are a good alternative to using foam or cotton wool for muffling noises at night. These earplugs may be particularly beneficial for people who are prone to ear infections, as they create a seal in the ear, preventing bacteria from entering. They also come with a pen that contains a unique active agent that is moulded into the pen, & is said to be able to kill 99.9% of all harmful bacteria & viruses. Based on reviews from others, these earplugs may be too big for small ear sizes. Their slightly sticky material may also cause long hair for women to get stuck to them at night. The Hush Plugz Silicone Earplugs are available to buy on Amazon here . 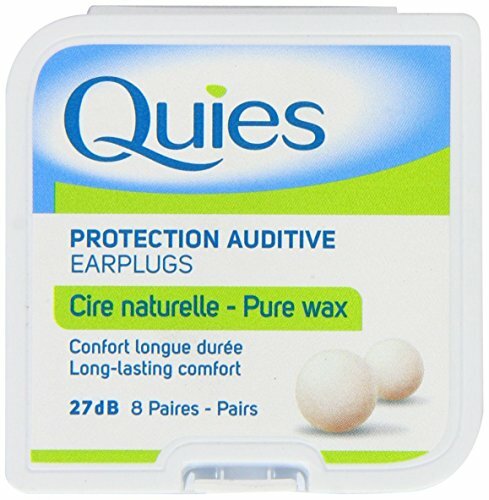 The Quies Boules Natural Wax Earplugs are recommended for people looking for a natural material option. Due to their natural wax material, they are reported to be very comfortable for most shapes of ears. They warm upon contact with the skin and become moldable to the shape of your ear canal. Based on reviews from others, these earplugs might not appear easy to put into your ears. Some have struggled understanding how to use the wax or hadn’t know to take off the cotton wool around them before inserting them. The Uvex Skyper with SCT Orange lens tint glasses are available to buy on Amazon here . Earplugs are small inserts that seal the ear canal from excessive sounds. They are mainly designed to reduce noise perception to either minimize damage to the eardrum or improve concentration and relaxation. They can also be used to prevent water from entering the ear canal, thereby reducing infection during swimming or other water-based activities. Different types of earplugs available to buy vary by noise reduction rating (NRR), performance, comfort, and durability. When to Use Ear Plugs to Help Improve Sleep? Noise during the night can have both positive and negative influences on sleep quality. Gentle, constant background noise, such as from gentle rain, can block out disruptive sounds such as traffic noise or loud neighbors. But intermittent, grating sounds, such as a thunderstorm or a partner snoring, can interrupt sleep and contribute to lower sleep quality. If you choose to use reusable ear plugs, it is important to keep them clean. Although you should not reuse disposable earplugs, if you do, these also need to be kept clean. Follow these steps to keep your earplugs clean. 2.1 What are Earplugs and What Do They Do? 2.4 When to Use Ear Plugs to Help Improve Sleep? 2.6 Is It Safe to Wear Earplugs When Sleeping?